Jump: TP Bonus only affects Jump and High Jump and only applies on the first hit. Jump: Double Attack affects all four Jumps. Jump: Accuracy is unverified but presumably affects all four jumps. All versions of Artifact Feet give an attack bonus to regular Jump only (+15% at 119). Reforged versions of Artifact Legs give an attack bonus to High Jump only (+25% at 119). All versions of Empyrean Legs give an attack bonus to Spirit and Soul Jump (+15% at 119). All versions of Empyrean Feet give a TP Bonus to Spirit Jump only (+70 at 119). Also first hit only. Ryunohige forces Jump and High Jump to be critical hits, but only Jump receives an attack bonus (+35% at 119). Jump TP is terrible, but Jump DA is great. Can have DA+55% on all Jumps with 1200 JPs, DA+10% Ambuscade Cape, and /WAR before adding in any other gear/buffs. So if you have the Ryonohige then you will be using Jump/High Jump most of the time? So basically it's a choice between Attack+10% and a VIT bonus to damage or double TP from Jump/Spirit, and shedding 50%+ Enmity or Attack+50% and triple TP from High/Soul. Jumps are primarily used for TP, so the choice is pretty obvious. Ryu IS the best weapon for any situation where your wyvern is dead though, including Spirit Surge. So given your Wyvern is alive the Jump Bonus from Ryu is pretty terrible? Braden, you seem to have some decent jump sets. Could you please post them so i have an idea? Ive been racking my brain to come up with a few things and even tho i linda like what i have, id like to see others so i can tweak my set up. These aren't the sets I use, but here's some examples of stuff you can aim for. I'm completely ignoring any expensive HQ pieces or gear from anything above content level 135. Generally, you'll want to achieve a good balance of accuracy, STP, and DA/TA/QA. Mythic AM3 has stronger emphasis on STP. When Spirit Surge is up, Jump and High Jump have 100% accuracy, so you can create sets for that too if you want. Grip: You obviously can't change this for Jumps, but Bloodrain is my recommended "all-around" grip. Neck: Ganesha's Mala is another great choice if you don't need STP or Accuracy. Earrings: The four options in the two sets should cover most of your needs, adjust as needed for accuracy. Rings: Chirich Rings are a good option if you're desperate for accuracy and STP in one slot. Back Brigantia's: DA beats STP except with AM3 up, although the difference between the two isn't very large. STR has a slight advantage when accuracy is capped, but DEX will cover more situations. Accuracy will be best for dyes. Maximizing capes isn't nearly as important as simply having one, so don't worry about it much. Waist: Like with necks, consider adding some QA in the mix with a Windbuffet Belt +1 if accuracy is capped. Legs: Acro Breeches should be focused on DEX/STR+DEX, Acc/Att+Acc, and STP. 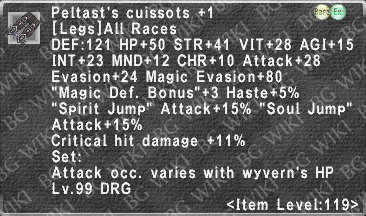 Peltast's Cuissots +1 perform pretty well just from damage despite the total lack of Acc/STP/DA. Pteroslaver Brais +1 are worth considering for Wyvern-present High Jumps if enmity reduction matters suddenly. Feet: Even without augments, these boots rule. Fern Stones recommended for regular stone augmenting. My set ups are similar except i have a little more stp because i use trishula instead of ryuno. Are you using a str or vit aug for the back? I use DEX since it's effectively 15 extra accuracy. VIT only affects regular Jump, so I wouldn't bother. STR is fine and does win by a tiny bit when hit rate is floored or capped, but DEX will have a huge impact on damage when it isn't. Cool, thanx for the advice. I think i have an idea on what i wanna adjust now. Mythic AM3 most certainly does work on Jumps. Any jump. It's a large part of what makes DRG so good at maintaining AM3. Mythic AM3 + spirit/soul jump is great TP gain. Well didn't know untill now. I was almost sure occasionaly x attack didn't proc on ja. Anyways how i can separate different set for jump and let check the gs when AM is active? Even non-mythic OAx can proc on jumps. The one OAX thing that doesn't proc on Jumps is Love Halberd. I'm guessing those amazing mega battery weapons don't work either. What sets would you suggest for Spirit and Soul Jumps? And oh hell, I necro'd the crap out of a thread for the 1st time! Honestly, you're just going to completely ignore certain pieces of equipment and gear like a Warrior. Some pieces only affect Jump/High, others Spirit/Soul, and then there's everything in between. For jump sets, your main goal would be to optimize towards multi-hit, accuracy, and STP - probably in that order. You're pretty much just using jumps to force multi-hit TP return. Jump/Spirit Jump are typically linked together unless otherwise specified. High/Soul Jump loosely follow the same rules. But the only way to know for sure would be to test various pieces and see if it's actually affecting "ONLY" those jumps or if it's linked to another. If you get really lucky and manage to load up any Valor pieces with a dump-truck ton of ACC, ATK, QA, and STP - more power to you. 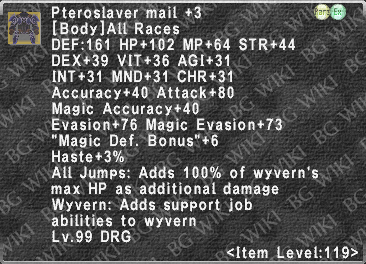 Another thing to remember is that Spirit/Soul will always be critical with your wyvern out, so you could play around with critical damage increase as well. Wow thank you so much for your time on this. It's given me a lot of thoughts and ideas to work thru. I wasn't sure if it was going to be worth it to do the Vishap Greaves but if you're telling me they work with Spirit Jump as well then I don't have a choice. Jesus the devs really need to get their ***together and make it much more easier to figure this out without abusing the player base to find it out for themselves. They probably don't, in this case. BG Says they work with Jump and High Jump for some *** up reason. This would be one of those, "maybe they do, maybe they don't; but don't waste 50m trying to +3 them to find out." The problem here isn't how they've always worked from the beginning of time till now, it's that SE might be trying to update how these pieces work at the moment. So these pieces could possibly go from only having affected literally just "Jump" to affecting "All Jumps" the way Ptero. Mail just did and no one would have a *** clue until they update the text. You could easily replace them with Valorous boots with like kind of bad augments or Flamma's +2 without even trying. And you'd probably be better off. I was just saying that as far as equipment that specifically affects Jumps, there really isn't much around that's worth using. This was specifically about relic+2 body, which was originally just for Jump and Spirit Jump, but they decided to adjust it and make it work with High Jump and Soul Jump as well. More often than not DRGs /SAM to cap the last 1.25% delay, yet by just tweaking your party setup/buffs you could just go back to /WAR to maximize your DPS and by association your Jumps. Countless times it was great to see 12-15k Jumps with just Empy Legs and Relic Body switched in TP set in capped situations on high-end content. Unless SE decides to alter all these random descriptions/functionality associated with Jumps its safer to use your multi-hit Set for any Jump at the moment.